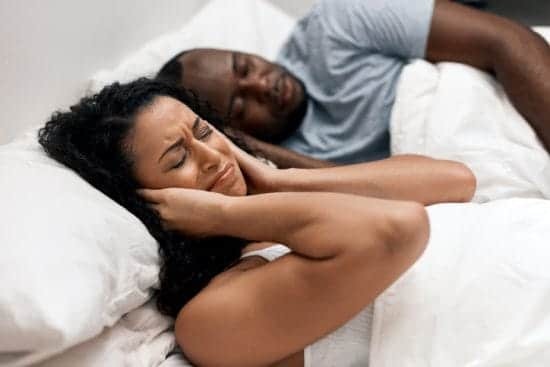 Snoring interferes with your sleep as well as your partner’s and can cause long-lasting harm to your overall wellbeing. Snoring occurs when air flows past relaxed throat tissues as you sleep. These tissues vibrate when you breathe, which leads to the snoring. Why do people snore as they sleep? If the flow of air is physically obstructed along the way, it can make these tissues vibrate as you breathe, which creates a snoring sound. Obstructed nasal airways – This can be caused by a cold, allergies, chronic sinus infections or structural issues such as a deviated septum or nasal polyps. Poor muscle tone in the throat and tongue – If these muscles become too relaxed, they can block your airway. Age can contribute to this issue, as can the use of alcohol or sleeping pills. Long soft palate and/or uvula – If your soft palate or uvula are oversized, they can obstruct your airway. What are some health risks associated with snoring? Irregular heartbeats – Also known as arrhythmia, irregular heartbeats such as atrial fibrillation are much more likely if you have sleep apnea. Strokes – Loud snoring has been associated with fatty deposits that cause the arteries in your neck to become narrower, increasing your risk of strokes. Daytime sleepiness – Sleep apnea interferes with your ability to get deep, restorative sleep and makes you excessively sleepy during the day. This can make you more likely to cause a driving or workplace accident. GERD (gastrointestinal reflux disease) – Sleep apnea may cause your throat to close in a disordered way as you sleep, allowing the contents of your stomach to back up into your esophagus. Heart disease – Sleep apnea has been associated with high blood pressure and coronary artery disease, which can increase your risk of having a heart attack. • Mental issues – Sleep apnea can increase your risk of depression and anxiety and also make it more difficult for you to concentrate and remember. Are there any treatments available to help with snoring? Lifestyle changes – Losing weight, reducing your alcohol, eliminating sleeping pill intake, and sleeping on your side. Oral appliance – Similar to a mouth guard, an oral appliance from Dental365Sleep helps keep your airways open by gently nudging your tongue and/or lower jaw forward. CPAP – A continuous positive airway pressure machine uses a stream of air to keep your airways open as you sleep. Some patients find CPAP machines to be bulky or uncomfortable and therefore, there may be less compliance. That’s why we recommend Oral Appliances professionally fitted by Dental365Sleep. Medication – If your snoring and sleep apnea are caused by allergies or chronic sinus infections, medication may be able to help. Surgery – Structural abnormalities such as a deviated septum can be corrected surgically, and a procedure can also be used to unblock and expand your sinuses. If you snore regularly, make an appointment or stop by one of Dental365Sleep’s convenient offices in NYC and the surrounding area. Our dental sleep specialists provide high-quality care and effective treatment options for snoring and sleep apnea.